Silent today, these 100-pounder Parrott rifles stand as stark reminders of our nation's bloodiest conflict. One hundred and fifty years ago, momentous events in Charleston Harbor marked the beginning of the American Civil War. It was here, at Fort Sumter, that sectional conflicts over slavery and the role of the federal government turned from rhetoric into full-scale violence. For 34 hours on April 12 and 13, 1861, Union and Confederate forces exchanged heavy artillery fire, announcing in a deafening manner that hostilities had commenced. The nation plummeted into civil war. Today, Fort Sumter National Monument is open to visitors 362 days a year. 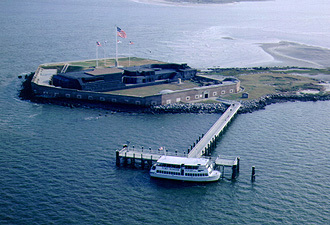 Situated on a manmade island at the mouth of Charleston Harbor, the fort is accessible only by boat. Concessioner ferries depart daily from two locations: Liberty Square in downtown Charleston and Patriots Point in Mount Pleasant. During the half-hour trip to the fort, an audio narration places the first bombardment of the Civil War in historical context and gives information on points of interest throughout the harbor. 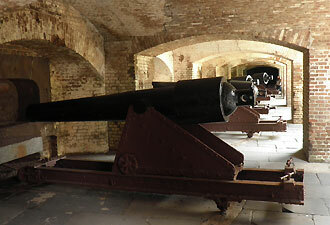 Upon arrival at Fort Sumter, visitors are often surprised by its relatively small size. Artillery projectiles (some of which are still embedded in the masonry) have reduced the brick walls from three tiers to a single tier. Although stabilized and preserved, Fort Sumter is a remnant of its former self — an historic ruin that reflects years of architectural modifications, battle scars, and weathering. Rangers offer interpretive history talks at the fort. Wayside markers allow visitors to discover the fort’s past on their own. Especially helpful is the park museum, which boasts a scale model of the fort and numerous artifacts, including the original 33-star U.S. flag that flew during the first bombardment and a Palmetto Guard flag flown by Confederate forces after the Union surrender. Another museum is located at the Fort Sumter Visitor Education Center at Liberty Square, featuring exhibits that explain the events leading up to the first shots. Perhaps one of the lesser-known facts about Fort Sumter is that it offers unparalleled views of Charleston Harbor. Turning 360 degrees atop the fort, visitors can see the Atlantic Ocean, barrier islands, two lighthouses, sea-going vessels, a stunning cable-stay bridge that stretches 2.5 miles, and the city of Charleston. Interested in seeing more? 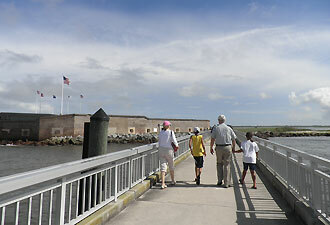 Fort Moultrie is also administered by the National Park Service. Originally constructed out of palmetto logs on Sullivan's Island in 1776, Fort Moultrie is the site of the first major patriot victory in the Revolutionary War. Active in military service for 171 years, Fort Moultrie now holds one of the best collections of 19th-century cannons. Charles Pinckney National Historic Site, located off Highway 17 in Mount Pleasant, was once a Lowcountry rice plantation owned by Charles Pinckney, a statesman and signer of the U.S. Constitution. Today, the site tells the story of this “forgotten founder,” his life of public service, and the lives of enslaved African Americans in South Carolina. For information and directions, please visit our park website. In April, special events and living history demonstrations will commemorate the sesquicentennial of the Civil War at Fort Sumter, Fort Moultrie, and Liberty Square. Come visit during this extraordinary time!